32 High Output lamps from 80-110w with 1x 400w HP facial. 15 minute max time, 3 beds available. 32 lamps from 120-High Output 160w with 3x 400w HP facials, an extra large tanning surface, and Mp3 plug-in. 15 minute max time, 2 beds available. Waikiki Beds "The Stand Up"
The Stand-Up unit boasts of the strongest lamps in the house! 42 High Intense 200w lamps! Stereo input is also included in the stand-up. This unit is a great booster to break plateaus, perfect for larger folks or those who simply aren't comfortable in the lay-down types of units, and ideal for getting those parts that are difficult to tan in a tanning bed. Waikiki Beds " The Lay Down"
42 High Intensity 160w lamps and 4x 400w HP facials - so intense you can turn them up and down! The "Bomb" also features raised, contoured surface for comfort, a reflective shoulder tanner, separate facial and body coolers, surround sound stereo, and she talks to you! 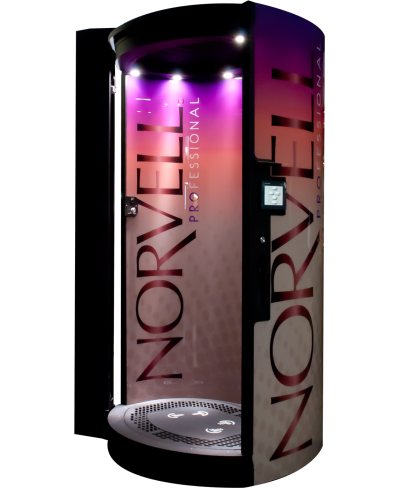 Custom air brush spray tanning with Norvell colors offers the most natural, just off the beach tan in the industry! All of Norvell's products are made with natural ingredients and designed to give you a natural color without the possibility of turning you orange! The ingredients that do that to your skin don't exist in Norvell solutions! DHA, the ingredient that gives you the long lasting (5-7 days) tan is 100% organic made from sugar! If you don't like going it alone in a booth for your spray tan - our trained and certified professionals will do it for you and make sure the outcome is exactly what you want! Choose from a wide variety of colors, or better yet, let your technician guide you to the color that is right for your skin and desired results. When prepared for and cared for properly, your spray tan will last about 5-7 days. Your spray tan includes a ph balancing prep spray, and you can also choose to add an optimizing finishing spray and the Lunar Booster (UV Boost, must have UV paperwork on file to choose this option) for just a few dollars more. We now offer Norvell ONE Solution! For a few dollars more, you can choose this fast developing solution that allows you to shower in just one to four hours (rather than the 24 hour developing time of normal solution). The longer you wait to shower, the darker your results. We offer this solution in the Bronze or the Venetian hues. For those who don't want to be sprayed by a live person. This booth is one of the newer on the market and offers the closest to a custom spray tan as any booth can. This is because of the built in sensors that know where to spray because it "finds" you. The booth also has downdraft technology to get rid of that clingy overspray. The heated auto dry will activate the spray and reduce imperfections from smudging. You can choose from Norvell Dark or Venetian, or the fast-acting Norvell ONE (just 1-4 hour developing time, not the 24 hours the others take!) in a light, medium, or heavy spray, and then choose to add on the optimizer and the Lunar Booster to set in and boost your color! Come on in, there's no appointment necessary because the entire process takes just a few minutes! We do ask that you come in at least a half hour prior to closing time as we take the booth apart each night to clean the filters and spray nozzle. If you haven't yet heard of this amazing way to reduce fine lines and wrinkles, help clear acne, reduce the appearance of stretch marks, and give you an overall younger, healthier appearance, search for it on the internet and watch some YouTube videos. You will be convinced that you simply must start using it right away! This unit is on wheels so you can roll it over the part of the body you are targeting. This is not UV light and will not tan you. It takes 15 minute sessions, at least 3-4 times per week, to start seeing the results. Please note: you will not notice a difference after a single session or even a week, this is a process that takes a couple of weeks of regular sessions and then maintenance. Please do not purchase a single session to try it, although we do have that option available. You will want to buy this service in unlimited packages of 3 months or longer for it to work. This is an investment in your healthy, youthful appearance! 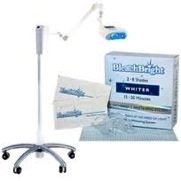 Professional teeth whitening system that will get your teeth shades whiter in just 15-20 minutes! This level of teeth whitening can cost more than $300 at other places, but we offer it for just $99 or two for $159. One for you and one for a friend, or one for now and one for later, you choose! Why pay more?